The Old Synagogue was the first and oldest synagogue. One of the cantors was Yehoshua Adesman and his son Avigdor inherited his position. The ‘Rashkeaver’ Synagogue (where Yoseph Master used to pray). The Shtefaneshti Synagogue. The beadle was Ruben and manager ('Gabai, HEB) was Berele Neta’s. It was popular amongst scholars as a gathering place for communal activities (debates, newspaper reading, etc). The Cellar (Di Bashke) - the central synagogue. It had a magnificent hand made Holy Ark. Famous guest cantors used to perform there. Also, it was used for public and national gatherings. Beith Yechiel – a new synagogue that was built in memory of Yechiel, son of Vaizman who died young. In 1940, it was turned into a hospital. In the beginning, education was run in the traditional ‘Cheder’ where children learned Hebrew and Chumash. Just before WWI, some parents resisted the traditional education. They felt that it was not enough and brought in teachers from other places. The Russian language and general topics were introduced, yet emphasis was given to modern Hebrew as addition to Cheder schooling. There was an experiment with teaching mathematics, geography and history; however the parents were mostly interested in Modern Hebrew classes for their children. An educational evolution came when the teacher Gavriel Fishman established his own ‘reformed cheder’. He named it: Avtalion. Gavriel Fishman came from Markulesht and established his home in Bricheva after marrying a local woman. He introduced reading modern books and newspapers in Yiddish, thus boosting Bricheva cultural life. Later, he grouped with a few teachers and together they established the Jewish school TARBUT. 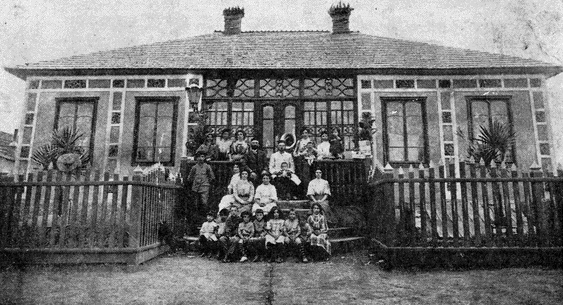 The school functioned until 1940. The planning of school was done in consultation with Kishinev Tarbut Centre. Representative (the lawyer Shmuel Rozenhoft) came to Bricheva in order to learn the issues. The Ministry of Education instructed them to build a suitable building, for which they needed money. A fund raising committee was established and the necessary funds were raised. There was also a public school which was run in Yiddish. The Yiddish teacher was Motel Glaizer (Motel Yiddish) who emigrated to Brazil later on. Within a few years the Romanian Ministry of Education forbade Yiddish at school and to ensure it, there was change of school management. There were also private teachers in various periods of time, many of them were “Hazen” (escapees from military service). Those teachers were intellectual ideologists who influenced the youth of Bricheva. They conducted discussions about the history of the Jewish nation, and introduced national and social theories. The 1917 revolution brought a wave of ‘independence’ and the youth of Bricheva began with their Zionist activism. Some of them went to study agriculture in a special IKA school in Lita. Higher education was given in the Gimansia of Belts, of Kishinev, Soroka, and courses in the nearby village Baraboi. The Yiddish oriented community developed a movement and named it Kultur-Liga. Bricheva became a preferred center that attracted lecturers and authors, such as: Eliezer Shteinberg, Izik Manger, Moshe Altman. The group Kultur-Liga established a Yiddish library. Books were supplied by a USA-based Bond agency. The public library was established by the Modern youth in 1913. The first location was in the house of Zusia Gelman. In the beginning, there were 180 books in Russian, Hebrew, and Yiddish. Over the years, the collection expanded with more books, encyclopedia and dictionaries, altogether 1,800 books in 1928. The library was also a cultural center for lectures and parties. It was supported by donations, special events and raffles. The public library offered the Kultur-Liga a library merger however the offer was rejected. When Russian began to diminish and Romanian was not yet introduced (post-WW1), Yiddish was an important cultural basis in Bricheva. During that time, Bricheva people tried to speak ‘high-Yiddish’, clean of Germanic/Russian jargons. After a few years, the Kultur-Liga library was closed due to lack of funds and its books were given to the public library. Romanian books were added and Russian books were taken out, whether due to lack of readers or by following orders of Romanian authorities. The Zionists established a newspaper in Russian (Iskurki V Tumane). It was a hand-written single copy magazine that was put in the library for public reading. Another Bricheva magazine was the Hebrew HAKOCHAV (The Star). This site is hosted at no cost by JewishGen, Inc., the Home of Jewish Genealogy. If you have been aided in your research by this site and wish to further our mission of preserving our history for future generations, your JewishGen-erosity is greatly appreciated.